1) Something new that I have not baked before. 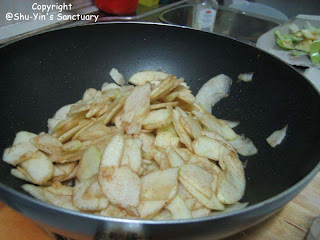 2) Easy to source ingredients with the main ingredients being apples. Could not find a suitable recipe so in the end combined 3 recipes I found online and adjust it to my liking and ingredients availability. 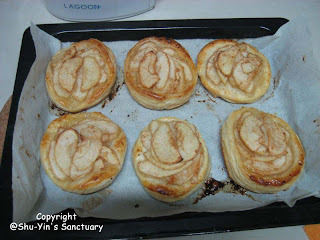 This time I did not make the puff pastry from scratch. 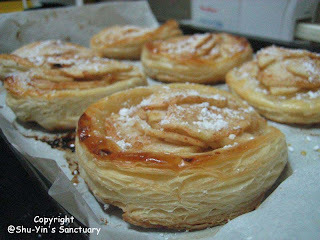 Bought the puff pastry from Cold Storage. 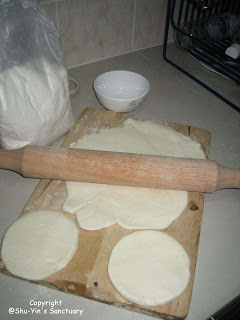 Rolled out pastry using rolling pin. Made it into 6 individual puff pastries. Brushed the edges with egg glaze (egg yolk, salt and milk). Arranged the apples on the pastry and ready to be baked in the oven at 200 degree celcius. 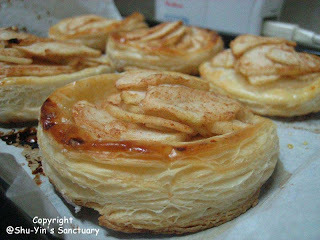 Baked for 20 minutes or until pastry is golden in colour. Look at my nicely puffed up apple puff. Dusted it with icing sugar or honey. Served with cold vanilla ice-cream. 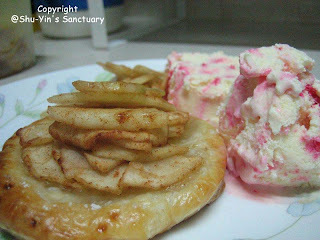 The warm apple puff and cold ice-cream will give you a very satisfying sensation! I love it! 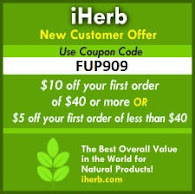 Try it yourself. 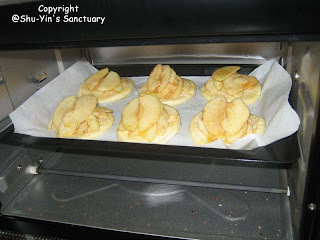 It is a very easy recipe to follow especially using store-bought puff pastry! mindy...nah. dont think so. i'll be lazy to bake so many times every day. Whoa! 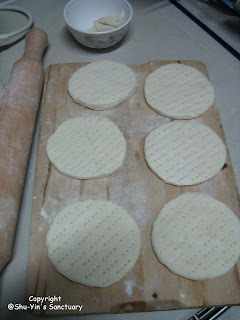 I will NEVER EVER use the rolling pin - because I'm lazy! Rolling pin = susah for me. LOL!